Homeownership has been an integral part of The American Dream for generations, but millennials are rethinking the plan. According to a new survey commissioned by Northshore Fireplace, 65 percent of millennials believe homeownership is a ‘choice,’ rather than a necessity. The survey results revealed that financial stress caused by student loans (40 percent) and consumer debt (30 percent), and worries about the ability to afford home and the down payments (65 percent) that come with it, may be behind the lack of enthusiasm over homeownership. Forty percent of the 2,000 respondents view homeownership as a financial burden and 41 percent are afraid of the burden of paying a monthly mortgage. 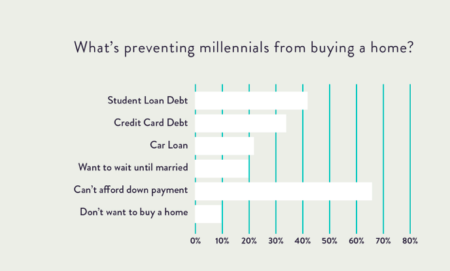 On average, millennials anticipate they’ll pay $218,512 for their first home, but 50 percent have less than $2,000 saved for a down payment — no where near the 10 ($21,851) or 20 ($43,750) percent down payment for a home at that price. Despite these concerns and barriers, 80 percent of millennials still think becoming a homeowner is a realistic goal and 46 percent plan to purchase their first home within the next four years, even if it means relocating to a more affordable city (65 percent) or state (41 percent). For the 33 percent of respondents who are homeowners, the top regrets were putting down too small of a down payment, not waiting to purchase a home, buying a home that’s too small, and handling maintenance issues.